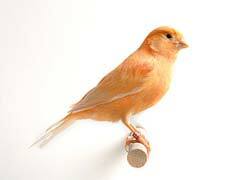 Caring for a Red Factor Canary is similar to caring for other canary types, with the exception of feeding and diet. A number of canary bird breeders specialize in this type of bird, which can range from orange to a bright scarlet. This type of bird needs to be fed a special diet so that the feathers continue to have the red coloring when old feathers are lost and new ones grow to replace them. If a special diet is not given that is rich in beta carotene and certain other nutrients then the result will be a Red Factor Canary that turns yellow after the molt is finished. There are many different types of canary birds for sale, because these birds make excellent pets. Before you decide to buy a Red Factor Canary you should evaluate whether you are willing to take the time and spend the money to keep your bird in top condition and coloring. It is crucial that your pet has a sufficient source of beta carotene at all times. You can provide this with grated fresh carrot, grated broccoli, and small pieces of other fresh vegetables that are rich in this nutrient. All of the effort and expense will pay off when you see your brilliant red canaries happily singing in decorative bird cages. Chemical supplements can be used for color feeding, but this is not recommended if it is possible to use fresh foods instead. In many cases using chemicals for color feeding can harm the health of your Red Factor Canary, and possibly shorten their lifespan. Instead you can offer berries, sweet potatoes, cherries, squash, tomatoes, beets, and other fresh foods rich in beta carotene each day. When these birds are molting it is important to provide plenty of protein as well. These singing canary birds can be a great choice for a pet, and when they are color fed properly they can be a beautiful addition to any home.